The first of two consecutive days at sea, heading from New Zealand to Tasmania. 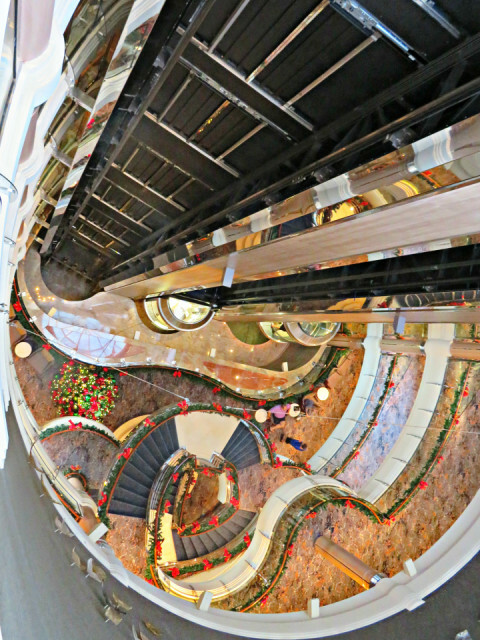 Consequently, there hasn't been any astonishing scenery to photograph today, so instead here's a rather vertigo-inducing view from the 12th deck at the top of the ship looking down the central atrium to the festive Christmas tree and decorations on deck 6. That black wall with the silver stripes is part of the glass-enclosed elevator system which rises and descends through the middle of the ship.